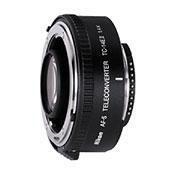 1.4X Teleconverter designed for use with AF-S and AF-I Nikkor lenses. Recommended with the following AF-S Nikkor lenses: AF-S 80-200mm f/2.8D ED-IF, AF-S 300mm f/2.8D ED-IF (II), AF-S 300mm f/4D ED-IF, AF-S 400mm f/2.8D ED-IF (II), AF-S 500mm f/4D ED-IF (II) and AF-S 600mm f/4D ED-IF (II), AF-S 70-200mm f/2.8G ED-IF VR Zoom-Nikkor. I bought this teleconverter when I bought my 70-200. So far I've had great results shooting wide open at F4, and better results when stopped down a stop or two. Haven't had to use it for the TC, but have used it before and have nothing but good things to say about them.